Laurie Meyer-Olson is a teacher. Her mannerisms, eye contact and authoritative yet comforting voice commands attention in the way one would expect from someone who has spent a lifetime instructing others. It’s a voice whose carefully measured responses shaped the futures of countless schoolchildren in her 30-plus-year career as an early intervention teacher. A voice that has imparted her faith on friends and strangers. A voice that passes on the traditions and knowledge to the next generations of her family. “I often underestimated my ability to make a difference,” Laurie said of her life. She doesn’t now. 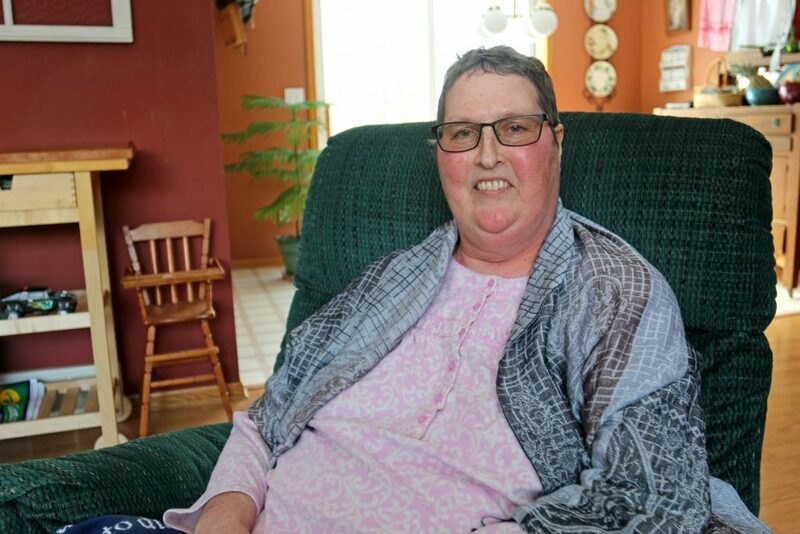 Presently, Laurie doesn’t refer to it as teaching; instead, she calls it “finding her voice.” She’s using her voice to express a valuable lesson—how to have a meaningful end-of-life journey with the support of Hospice of the Red River Valley. Not long ago, Laurie used the 16-mile commute from her rural Becker County home to “prepare for chaos” in her role as a special education teacher in Detroit Lakes, Minn. The children she worked with had special needs. She would often be welcomed into families’ homes to help children learn and reach goals identified by their parents. “It certainly had its challenges, but I always found it to be my calling,” Laurie said. But in fall 2017, her health started to unravel. A diagnosis of endometrial cancer was followed by surgery and aggressive chemotherapy and radiation. Months later, Laurie was diagnosed with breast cancer. Each of six chemotherapy treatments left her with successively longer bouts of vomiting and extreme fatigue. Radiation treatments also had side effects. In August 2018, Laurie collapsed from a blood clot in her lung. “Being sick was becoming my new normal,” Laurie said. Laurie was ready to begin her end-of-life journey. Laurie knew of hospice care. She heard positive stories from a Bible study friend who also was a hospice nurse. This familiarity made her decision to contact Hospice of the Red River Valley easier. Now Laurie is the one welcoming a team of caregivers into her home. 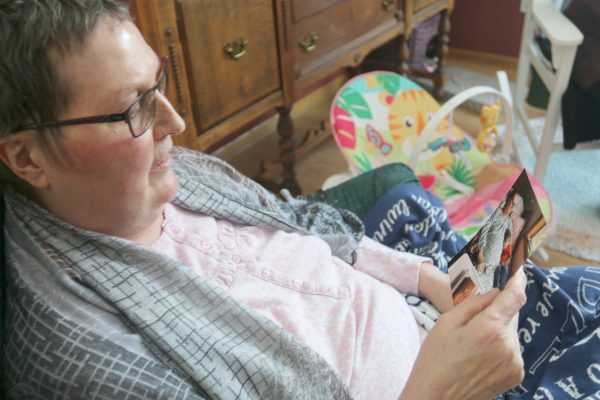 Free from grueling cancer treatments and its demanding tolls, hospice professionals are helping Laurie set and achieve her own, new goals— decluttering her home, making memories with grandchildren and simply living in the moment. A string of aprons hang along Laurie’s kitchen wall. Some are handed down from past generations. Others she simply likes. A cookbook sits on the center of her dining room table. The pages are open to a lefse recipe. Laurie plans on boiling potatoes this afternoon. Russets, with their lower moisture content, are the key, she says. Another teachable moment. Laurie is the family baker, and she is using the time hospice care has given her to pass on family traditions. Laurie chats with members of her Hospice of the Red River Valley team. Quickly, Casey Donarski, registered nurse with Hospice of the Red River Valley, along with the organization’s medical director and nurse practitioners got Laurie’s pain and symptoms under control. They answered Laurie’s many questions. Medication adjustments eliminated side effects. They’ve helped Laurie eat what and when she wants. Casey and other Hospice staff have provided more than just physical relief, but also emotional support and comfort. Though Laurie had been familiar with hospice care, she didn’t realize the depth of support it could provide. When someone is diagnosed with an incurable disease, everyone hopes for more time. Hospice care may not extend the quantity of one’s life, but it can vastly improve quality of life. Laurie enjoys visits by Lauryl Ivers, Hospice of the Red River Valley chaplain. As part of the hospice interdisciplinary team, chaplains provide spiritual comfort at the end of life, if desired by the patient and their family members. “She has been gracious enough to talk to me and give me whatever it is I need,” Laurie said. Now, free from pain and symptoms and with the gift of time, one of Laurie’s challenges is knowing where to expend her limited energy. She said Hospice staff has helped her prioritize her time. “People need to know how valuable it is to have this time, but also how valuable the services Hospice of the Red River Valley provides,” Laurie said. Laurie said her biggest surprises on hospice care are the comprehensiveness of services and its affordability. Hospice care is typically covered in full by Medicare, Medicaid and most private insurance providers. Hospice social worker Traci Elshaug has offered support, too. She’s shared with Laurie ideas about pillows she can make for her grandchildren or how to share a children’s story about death. She told her about the Celebration Bears program where Hospice of the Red River Valley volunteers create special bears made from a loved one’s clothing as a keepsake to celebrate their memory. “I have appreciated Traci as a part of our team as she has been a sounding board as we have navigated the process of the ‘business’ of dying—talking through things such as power of attorney, living wills,” Laurie said. Traci also has provided resources about the bereavement care Laurie’s family will receive after her death. most comfortable,” said Laurie, who expects she would be in a hospital bed if not for hospice care. There is no end to the “why” questions from two-and-a-half-year-old Cooper. Laurie looks at photos of her grandchildren. Laurie responds with honest, direct answers. It’s an effective approach she learned from her teaching career. Likewise, Laurie appreciates her Hospice team’s straightforward, direct answers to her questions. Laurie’s son, daughter-in-law, and grandson, Daxton have traveled from Bozeman, Mont., to visit, in addition to sending photos and videos and calling or using Facetime to regularly communicate. In fact, Laurie and her husband visited Daxton and his family as a reward for completing chemotherapy. Laurie wrote letters to her children and laid out expectations for her grandchildren. She’s been recording messages so her grandchildren will know her voice. It’s a great gift that Laurie likes to share with those around her. She says people often tell her that, at 58, she is dying too young. Laurie assures them that she’s done what she needed to do in this life. Laurie Meyer-Olson is a teacher, until the very end. This might be her most extraordinary lesson of all.